Really it could go either way….slopes or crafting right??! We are actually doing quite a bit of both around here. It is cooold still and school continues to be cancelled on random weekdays due to the cold, we were off yesterday and today for temps that were in the -30’s with the wind-chill! Luckliy every Friday the mercury climbs up to perfect temps for hitting the slopes, in MN we have great hills no actual mountains, but we don’t mind! So we are bumming and skiing/snowboarding, it is polar (ha ha) opposite of the California version of boarding and bumming since we aren’t getting tan, but I could not have planned it better myself. 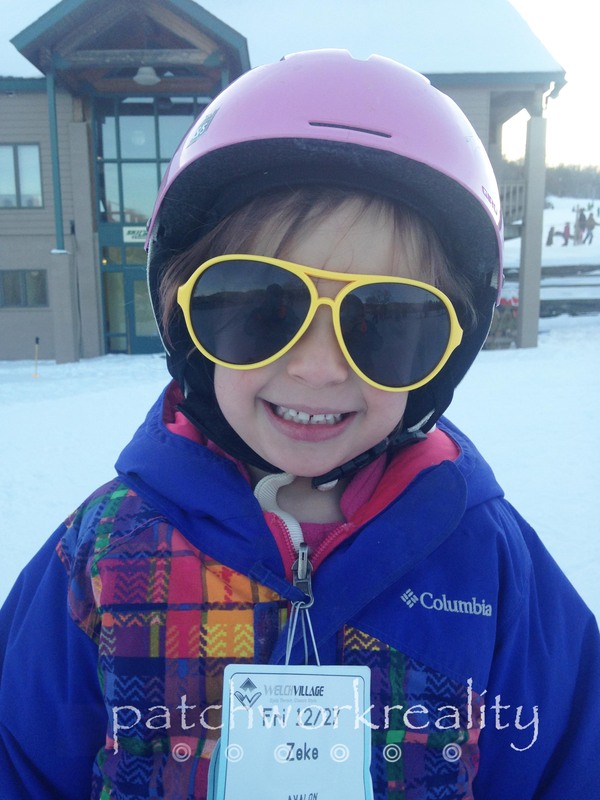 Mostly we are spending times off the slopes inside, so I am trying to keep a balance between reading, eating, bickering, and screen time…not all that easy! 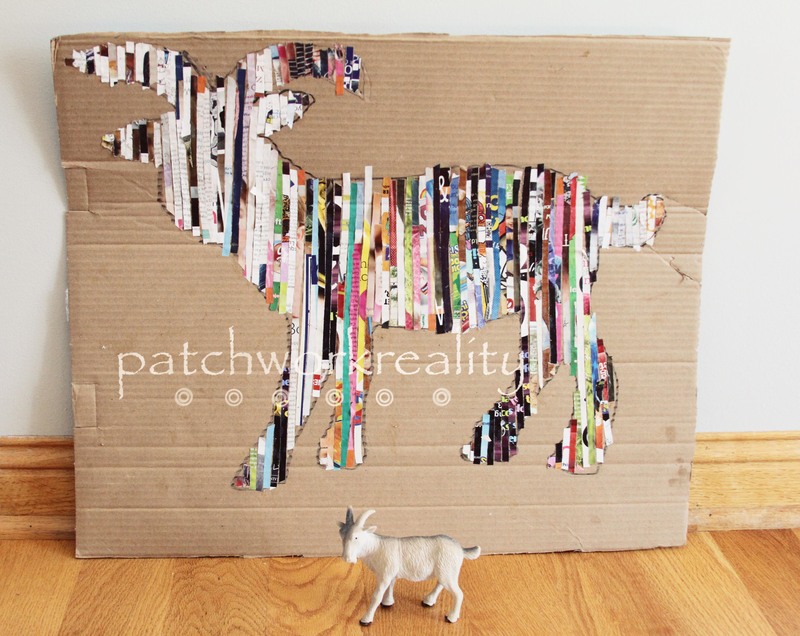 Here is the project we did yesterday, inspired by this pin on pinterest. 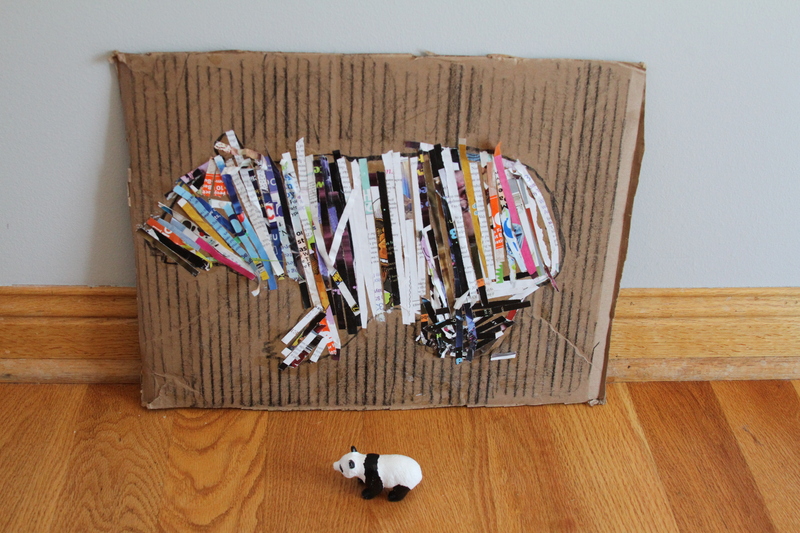 This seemed like the perfect cold day craft….we have cardboard boxes and magazines laying around so we set to work. I was not sure that I would be able to free hand draw a large shape that would resemble anything better than an amoeba, so I got our the overhead projector that comes in handy at the most wonderfully random times, I posted about it before here! The kids got out their large bin of “figurines and animals” and chose the one that they wanted. It worked best to lay the object on its side, and then we adjusted the projection to fit on the cardboard which was propped against the wall and then the kids traced the shape onto the cardboard in pencil. 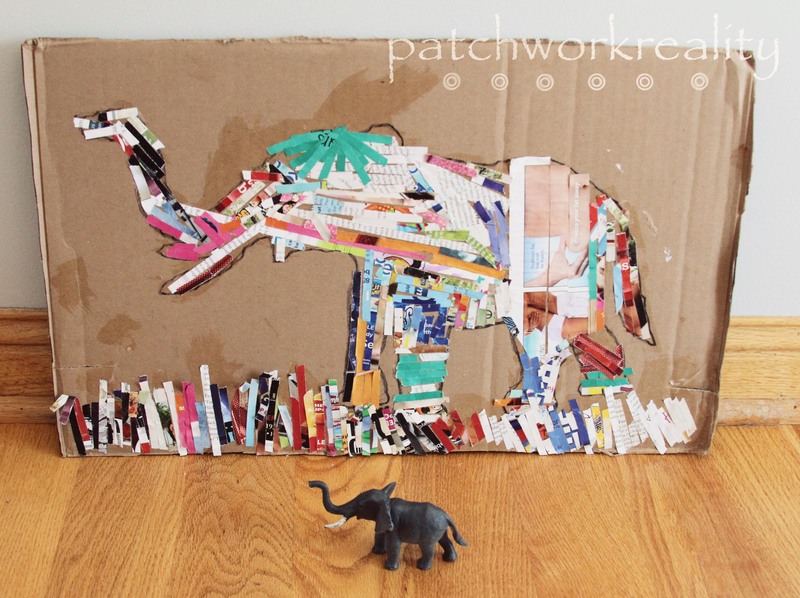 At first we were going to just rip the paper or cut it into thin strips, however with small hands it was looking chunky and not as uniform as we wanted. So we employed the help of a paper shredder (which only momma was in charge of! 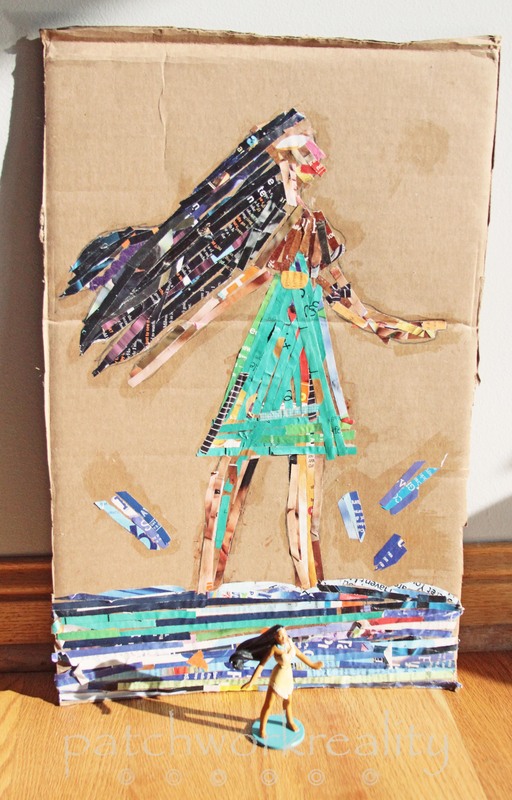 ), we borrowed from a kind neighbor, and shredded up old magazine pages. 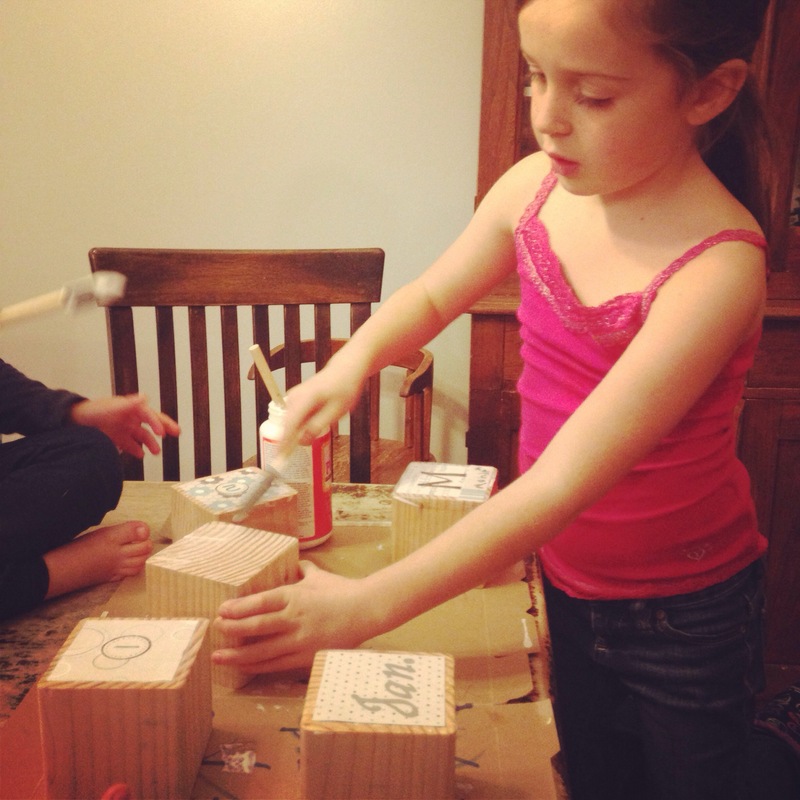 The kids spent truly spent 2-3 hours gluing down the strips onto their shape…I mean quiet craft time is like silent gold am I right?!?! At some point we ditched the white glue bottle and got out modge podge which is why some spots on the finished project are shiny…I would recommend this, it seemed to secure the paper better, and not leaves any loose spots that may tear off. 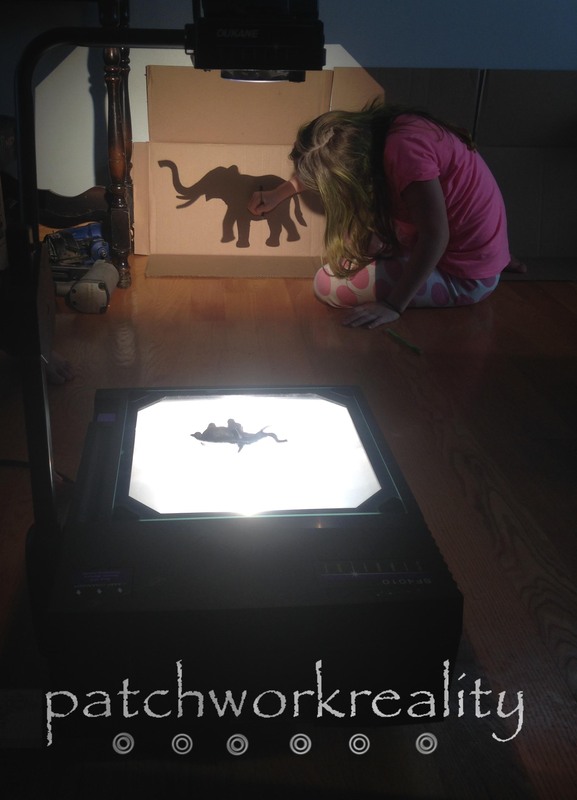 Really an easy craft with what materials most of us have around the house, if you do not have a projector you can certainly free hand a shape, I am sure most of you out there have better art skills than I! And just one more…proof that the sun does shine on MN hills! 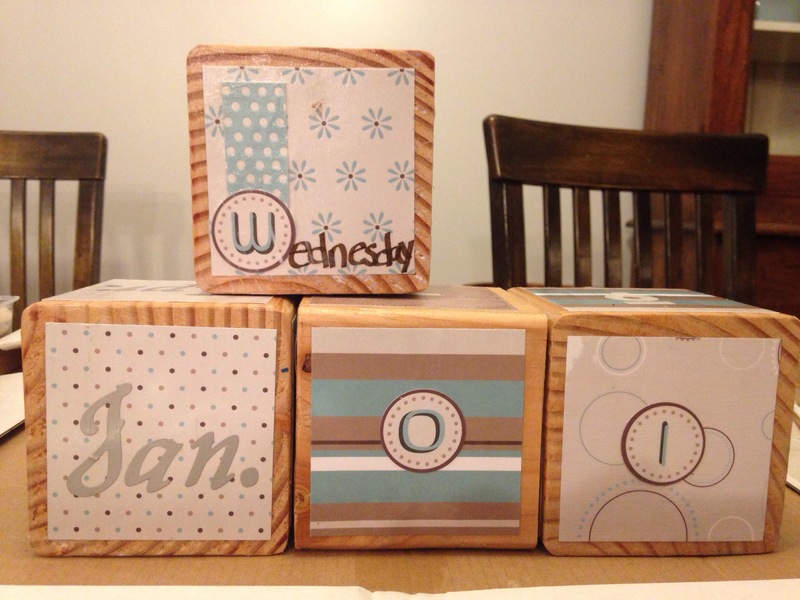 I saw this block calendar project on another site and was smitten , that’s a great winter time word isn’t it. My mind instantly thought “we can do that”. 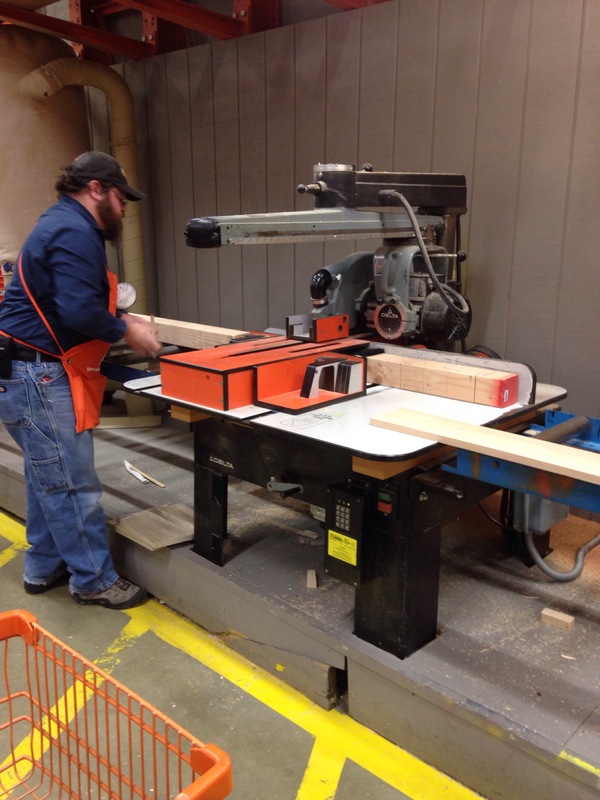 So we set to work, I even asked the amazing man at Home Depot to cut a 4 x 4 post into squares for me…. There are about 30 in a post. THANK YOU!! Finished late on the last night before the last day of school for 2013. I hope her teacher likes it. Because we do. These photos are from my phone and may not be the best, but I am thinking we will make this project again very soon and I will post a tutorial with some better photos and instructions. The kids really liked making this. Santanna’s best friend has an older sister, who is battling a brain tumor with all the energy she can muster. I know I have briefly written about this before, and I ran my last marathon for team Ana. Elsa and Santanna have an extremely special bond. We are a place that E can come and escape some of the burden of chemo and pills and sadness that is detected even when I am sure it is trying not to show itself. She is a “super sib” and has been praised as that in many aspects and events. Not enough in the shadow of cancer, but she knows she is loved and valued. Santanna and Elsa have know each other since they were 3 and now that they are both just turning 6, that is like forever! All Elsa wanted for her birthday according to her mom was Santanna. What do you give as a gift to a girl who adamantly prays for a cure for her sister’s cancer? For normalcy? 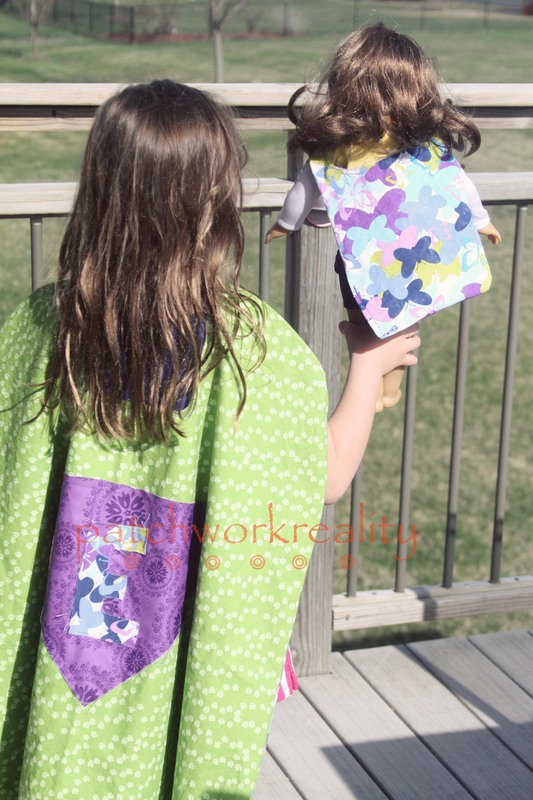 But we did make her a super E cape, a reminder that she is amazing and wonderful, and as many other little girls would love…one for her American Girl Doll. It was really an easy project, and E loved it!! If you have it in you, whatever your persuasion or belief, even though you do not know their family, will you please take a moment and use your heart to give a beat for Ana. They really are an amazing family. I know they will feel and appreciate it. Super cute right, it got my mind turning, then I remembered all that fabric I had thrifted last year and posted about here, and thought, ooh I can make one of those. Lets segway for a second; I think there are two kinds of people, those that go to craft shows and buy cute things and artfully decorate their home, then there people like me that go to shows, and scour Pinterest and think, I can do that….. although this is not always true, and it is in no way is a discredit to original ideas and artists, I think we just really think we can do it. 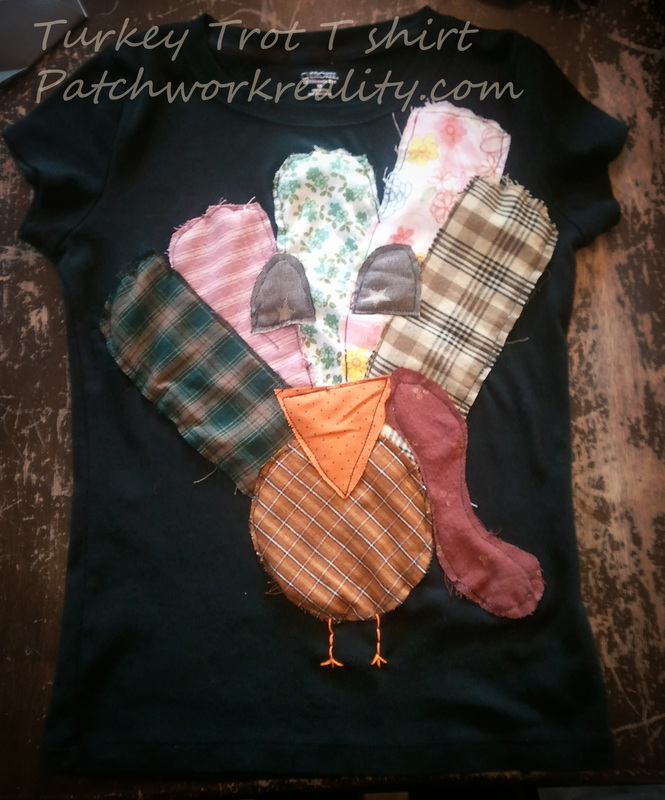 We are literally in the mindset that if you can do it so can I.
Ok back to the shirt, I can make one of those……with my 5 previous hours of experience on my sewing machine, of course I can make a Turkey appliqué shirt, hellooooo I have a Pinterest account….geeez. Well, I did it, and I love it, however, it was not as easy I thought and I definitely had to separate myself and the sewing machine (she is going to need a name) me to reassess my strategy and the machine for poor behavior. It seems to me like all we ever get in the mail are bills, magazines, political propaganda (which I think is over now, thank goodness), and an occasional party invite. 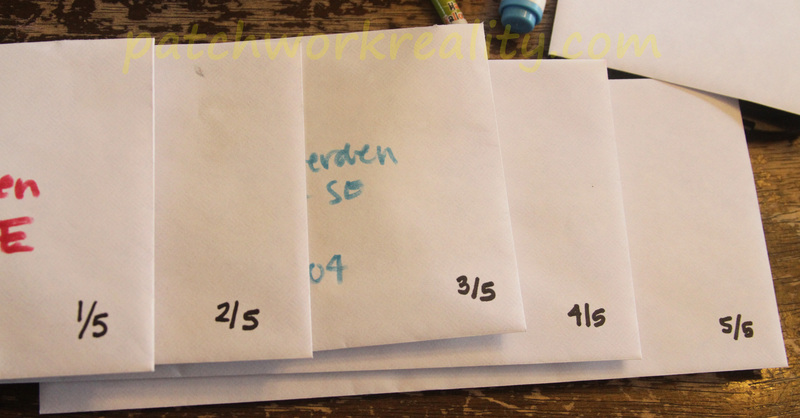 In my sometimes old fashioned nostalgia I encourage our kids to send letters to friends or family. 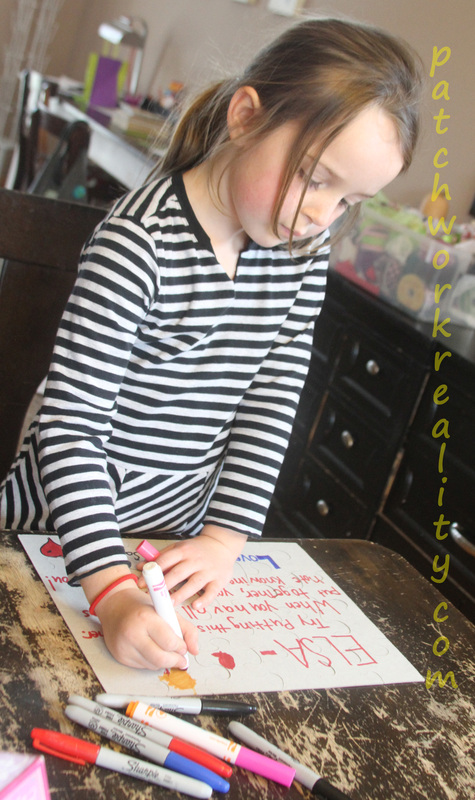 Santanna is especially fond of making letters and pictures for her little friends. Who does not like to receive a fun piece of mail personally addressed to them in ink?? Our friends daughter, who I wrote about previously who is battling brain cancer, is getting an overwhelming amount of mail, letters and packages, guess who feels a little left out/angry about not getting any mail? Little sister Elsa. So, her mom grudgingly asked if we could help a girl out and send some snail mail Elsa’s way. I think we all know how hard it can be to actually ask for help when you need it right?! This got me thinking, we needed to blow up this girls snail mail box, how many pictures was Tanna willing to color? Went to savers (you might have one of these not being used at home as well, we recycled this one, you might be able to repurpose your own), bought this puzzle. 2. We put the puzzle together upside down. This is harder then you think wihtout picture clues. 3. I helped Santanna write a letter and she drew whatever and decotared whatever she wanted in Sharpie and Crayola markers. 4. 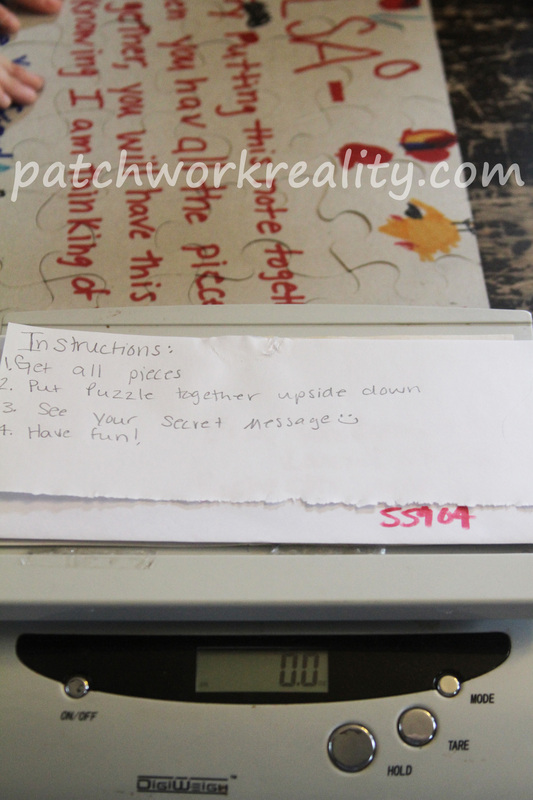 I included instructions with the first envelope. 5. Then we took the puzzle about, mixed it all up and I got out my postal scale for mailing packages and we weighed each one equal to/less than an ounce. For this puzzle it was about 5 pieces per envelope. I am so excited for her friend to get this, she is going to be thrilled, plus it gives her something to look forward too. I think I am also going to do this when the big kids are at camp for the summer. 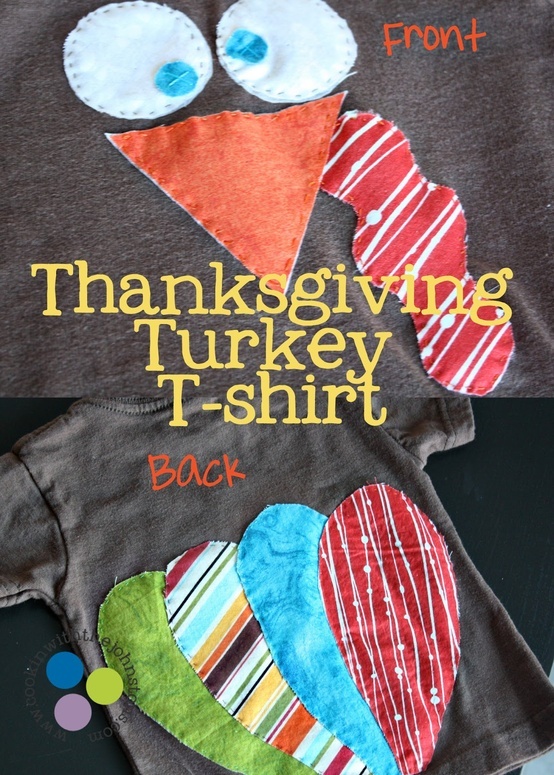 This is such a fun and easy craft to do with all ages. 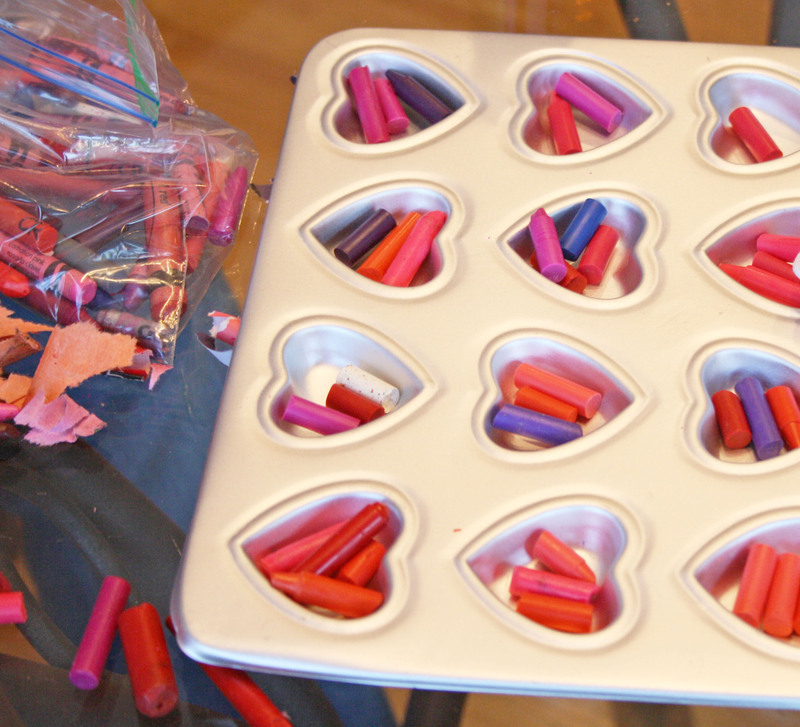 These are great to give as little Valentines’ tokens or to make and bring into your child’s school, they are also really cute to fill a vase with and then put flowers in. Anyway, this is very easy and does not require reaaly strict instructions. 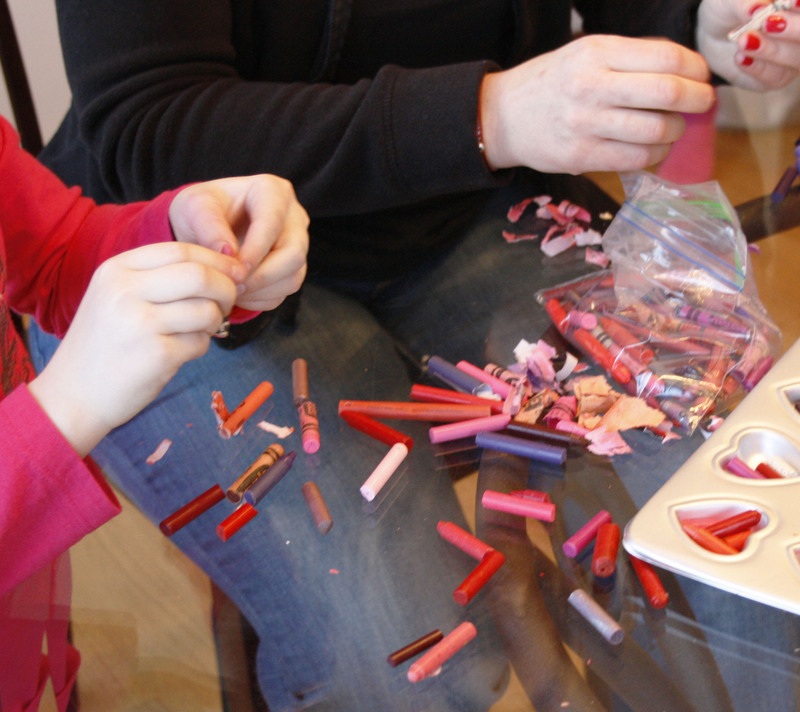 First gather all your broken crayons, these work best, but if you need to buy some that is fine also, you will just need to break then to fit in the pan. We divided them into colors that I thought most fit the Valentines’ theme, pink, red, white, but a heart crayon can be any color you choose. Heat your oven to about 200, this is again not a strict temp, it needs to be warm enough to melt the wax, but not hot enough to cook it. 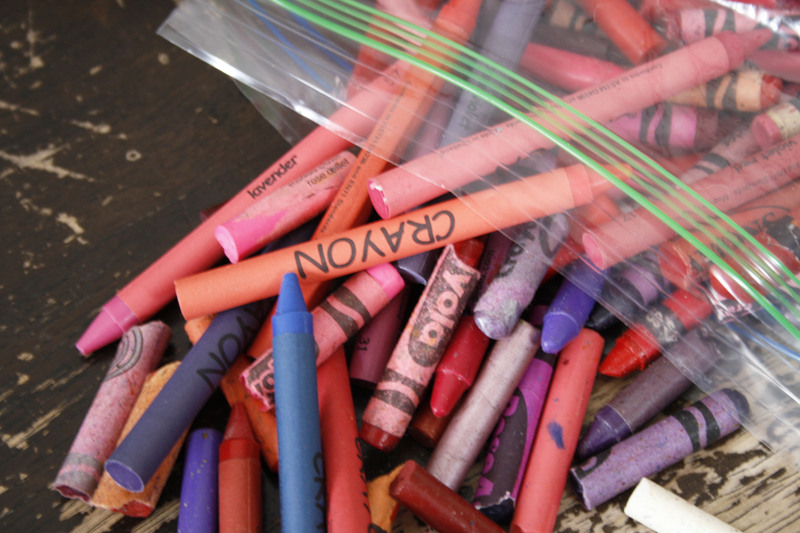 Peel all the paper off your crayons, here is where the patience is needed this can take a bit. Break your crayons into pieces that will fit into your pan. 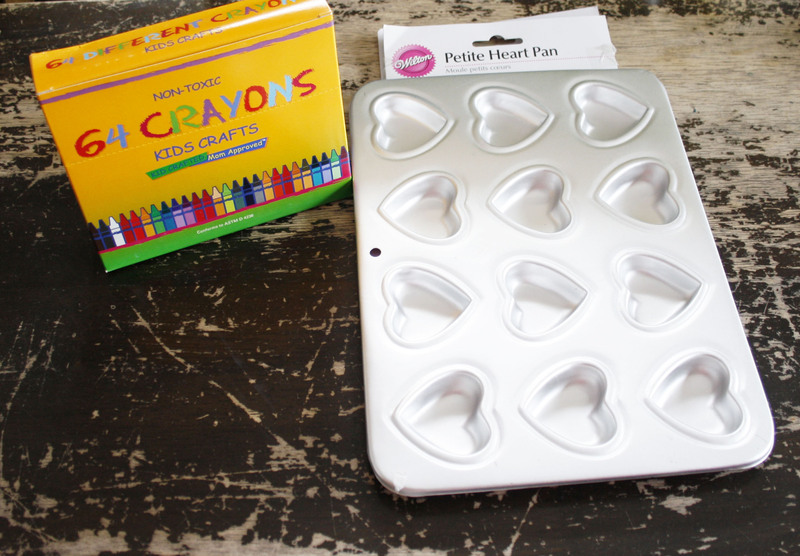 Put the pan into the oven, check in about 3-5 minutes, this will all depend on the size of your heart pan and then number of crayons that fit in each space. 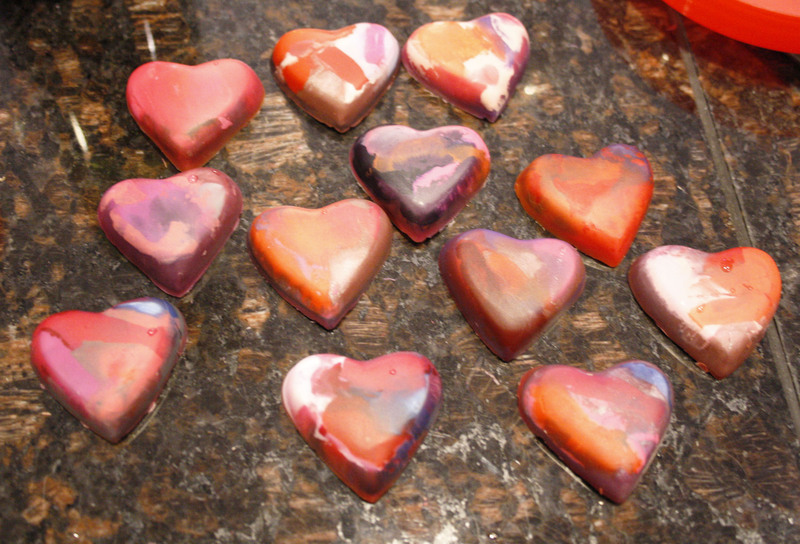 Once all the wax has melted and congealed (love that word;) we found it was best to pop the pan on a cooling rack into the fridge to let the was reharden, and they popped right out quite easily for the most part.